What is biometric Time Attendance ? Biometric time attendance system is widely used by many small and large scale companies for tracking the punctuality of their employees. The system enables the companies to have full control on all the employees’ working standards right on their fingertips. And those companies who want proof with respect to maintain their labor regulations must need to install this solution. One of the major benefits of this system is that it protects the company from payroll fraud and provides high level of accuracy for both the employee and the employer in accord to their remuneration. 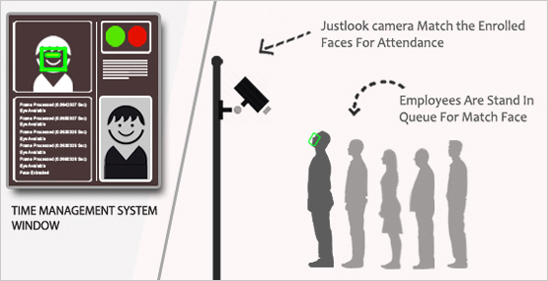 JustLook face recognition time attendance is designed to meet the high level of accuracy required by the employers of various organizations. Many corporate organizations, government sectors and heavy industries are holding the major portion of our clientele network. Our committed products with excellent professional services guarantee you high quality biometric security solutions that will help you to maintain the overall productivity of your company. JustLook Face recognition system works on the basic principles of facial parameters. It analyzes facial features of every employee with respect to their biometric nodal points including shape and size of nose, depth of eye sockets, shape of jaw line and cheekbone and many others. Whenever the employee enters or exits from the premise, it records his entering and exiting time which will be further used for payroll process of the company. Again, it can be also used for judging the punctuality and capacity of every employee which helps the company to make accurate decision about the allotment of work. It calculates under time and unpaid leaves of every employee to reduce impact on productivity. Based on no-human technology, it eliminates human error in employee’s time to provide monetary advantage to the company. It can be customized in accord with the requirements of each organization.